LA VERNE, California-- A family dog bitten by a snake is alive, thanks to a La Verne police officer who went above and beyond his call of duty. 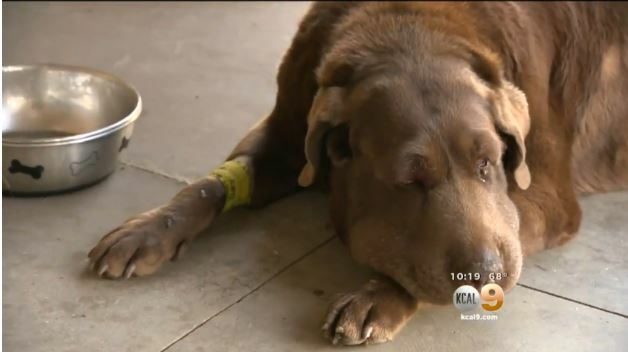 About 4:20 p.m. Monday, Officer Chris Dransfeldt responded to a 911 call from a frantic teenage girl, who reported that her 11-year-old chocolate lab named Bailey had just been bitten by a rattlesnake while playing in the back yard, reports CBS Los Angeles. When the officer arrived, he saw the snake before it slithered away. He also noticed that Bailey had been bitten near his right eye, and his face was starting to swell up. The 17-year-old girl did not have a car, and her mom was at work. By the time she got home, it might have been too late for Bailey. That was when Dransfeldt put the dog in his police cruiser and drove to the nearest animal hospital in La Verne, which did not have antivenin. As Bailey sat in the backseat whimpering from pain, the officer drove to the VCA Central Animal Hospital in Upland, where veterinarians gave the pet antivenin, along with fluids. Bailey spent the night at the hospital and was released Tuesday morning. He is back home recovering from his near-death experience. The teen said the reptile was about 4 feet long and was rattling. "I was panicked. I just remembered feeling like such a great relief" to see the officer. "I didn't do anything that I wouldn't expect somebody else to do," Dransfeldt said.